The tents begin to pop up in the parking lot of a rural fairgrounds on Wednesday evening, the night before the largest free medical clinic in Virginia opens. 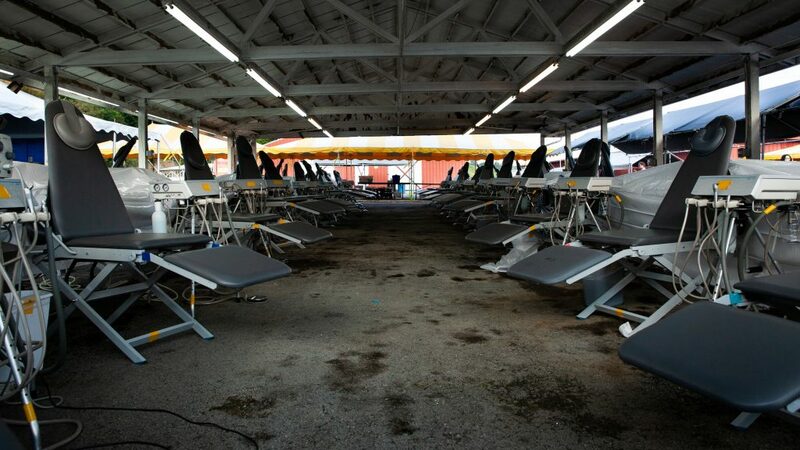 It would be 10 hours before the gates would open to the 2,000 or so people, many sleeping in their cars, some from as far away as West Virginia and North Carolina, to obtain the only medical attention they might receive this year. 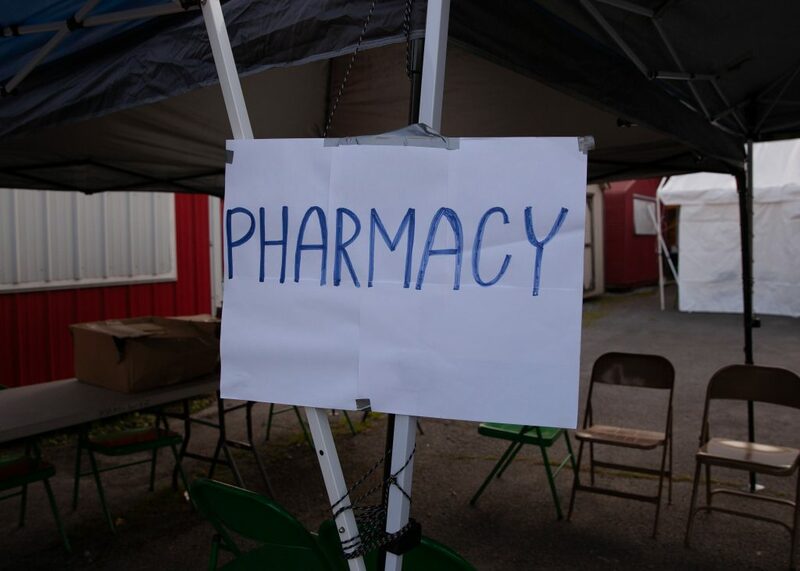 The fairgrounds of Wise, a small town in deep southwestern Virginia, was home to a three-day long free medical clinic provided by non-profit Remote Area Medical. Founded in 1985 by Stan Brock, who hosted Wild Kingdom, the organization has offered nearly $120 million in free medical, dental, and optical services to patients all over the world. Beginning as an international organization, like Doctors Without Borders, the group quickly shifted to a domestic focus, and now nearly 90 percent of their operations occur in the United States. At Remote Area Medical, insurance coverage–or the lack thereof–does not matter. Citizenship does not matter. Children, disabilities, pre-existing conditions; none of these are a factor. The only consideration is the pain a patient suffers. For almost 20 years, Wise has been home to one of the largest of these remote clinics operated in the Commonwealth of Virginia. And as a region with one of the largest number of uninsured individuals who work, situated between Dickenson and Lee Counties, Virginia’s largest free clinic is providing vital medical care to a population that has no other options. Doctors, nurses, dentists, and medical professionals and general support staff alike all volunteer their time, working from 5:30 a.m. until 4 or even 6 p.m.. Some come out of retirement, others use vacation or personal time, and they come from all over the country, drawn by the great need and a desire to help. 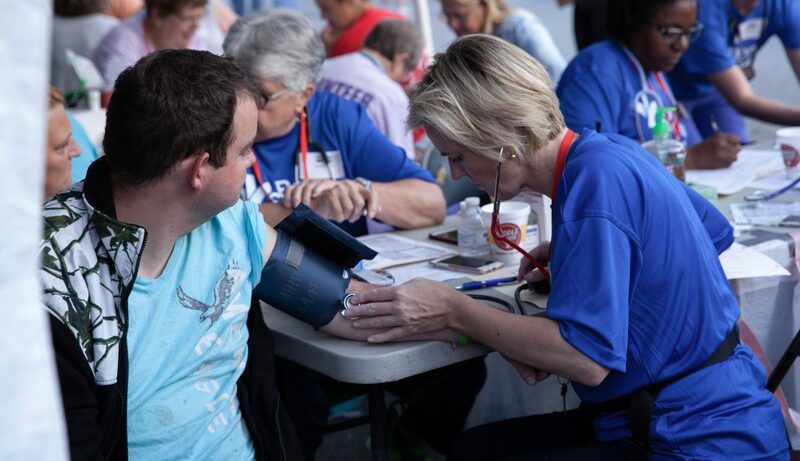 While the clinic was held in the Wise fairgrounds this year, Remote Area Medical has operated clinics in a variety of locations, ranging from airplane hangers and NASCAR race tracks to schools on summer break. 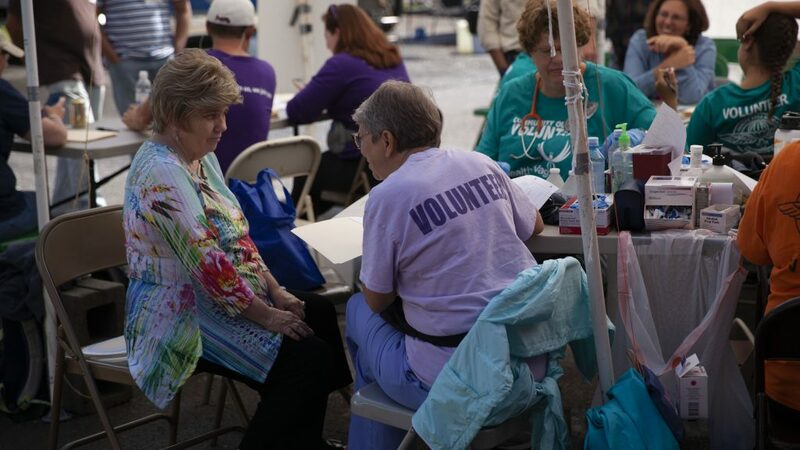 At the fairgrounds, patients sat in bandstands, and an array of services–including donated clothes, shoes, school supplies and books–were located in tents, RVs, and even a horse barn throughout the site. The horse barn offered triage and intake before patients were sorted out to the service providers. Cardiovascular, audiology, and women’s health were all on offer; in an enclosed, air-conditioned tent, the group also operated radiology, urology, plastic, and dermatology clinics. Some 40 percent of Americans lack dental insurance, according to the National Association of Dental Plans, and dental care is one of the most requested services at the free clinic. 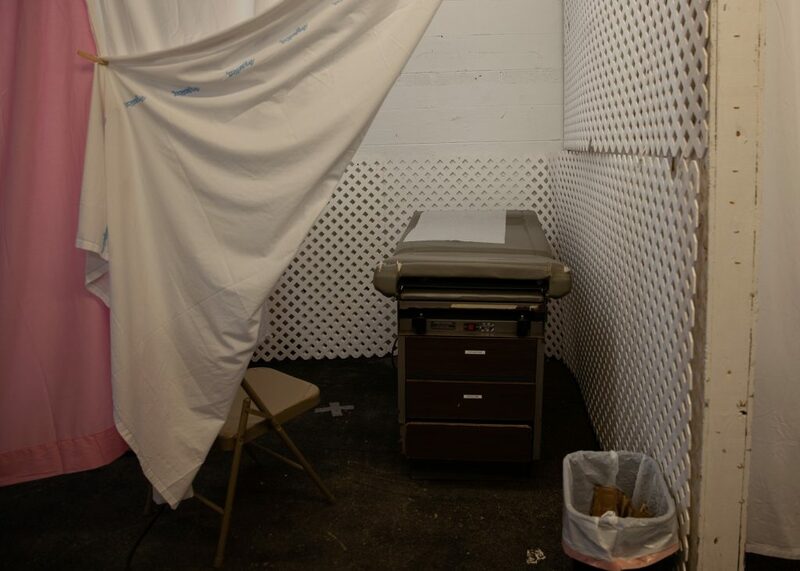 The tent housing the dental clinic had space for nearly 30 patients at a time. Despite the range of professional services and the quality of care, portions of the clinic were shockingly improvised. Livestock stalls were separated by gates and bed sheets, all clipped together with clothespins. Duct tape was a mainstay, and plastic buckets held biohazardous waste. Although the surroundings were humble, patients flowed through comfortably, thanks to a high-degree of coordination and professional support. People come to the clinics for many reasons. Although some of the 2,000 participants are unemployed, many have jobs that earn below the federal poverty line. Both groups lack insurance, placing them in a group that includes nearly 13 percent of Americans. Others lack dental insurance, or have health insurance coverage which doesn’t cover necessary specialists. All of them live precariously, balancing their health against their bank accounts, as they await the annual clinic that may be their only chance for free, necessary medical care each year. Sandra Schwaner, a nurse practitioner from Charlottesville, praised the attendees and the community of Wise. “People are always very grateful. They’re very happy to be here. You’ll see a lot of people who literally dress up to come to RAM,” she said, using a common acronym for the organization. Even some people born in Wise who have moved, like Autumn, who came from North Carolina, return for the clinic. “We don’t have insurance, and it helps tremendously. It helps everybody. I’m so grateful for the things that they do,” she said. Even for people with insurance, the region lacks medical facilities. Schwaner described it as a healthcare desert that specifically lacked specialists. “They have to drive to Kingsport [Tennessee], and some of these people don’t have cars, or they can’t take time off of work, or there’s one car for the whole family,” she said. And for those who are uninsured or not making enough money to take time off for a drive to Tennessee or further, the lack of care has a significant impact on their health outcomes. The resilience of the people who come to the clinic is extraordinary and almost uplifting, but the reasons these folks have to wait a year for basic and life-preserving medical care are staggering. Despite living in the same state as those of us in metropolitan Richmond, they are often described as alien or unworthy of baseline medical services. Despite the stereotypes and the lack of attention, though, these are the very same people of our beloved Virginia, subjected to a system that feels cruel and unfair. The crumbling coal and factory industries have left them without jobs or opportunities, and government services have failed them. They struggle to survive in rural communities that once promised opportunity for hard-working, independent people like themselves, a way of life that seems to have been completely erased. Although it can’t replace the year-round care the people of Wise need, Remote Area Medical provides at least one beacon of hope, by bringing in caring, compassionate medical providers to a group of people who deserve so much more than they’ve gotten out of life. All photos credit Sarah Kerndt, who contributed to this report.